Magpie Games has reached a multi-year licensing agreement with Leder Games to produce a tabletop roleplaying game set in the world of Root: A Game of Woodland Might and Right. Root is an asymmetric game of war and adventure in which multiple factions battle for control of a vast woodland. Caught between the invading Marquise de Cat and the established aristocracy of The Eyrie Dynasties, the Woodland Alliance plots revolution, while the Vagabonds of the forest seek fame and fortune for themselves. 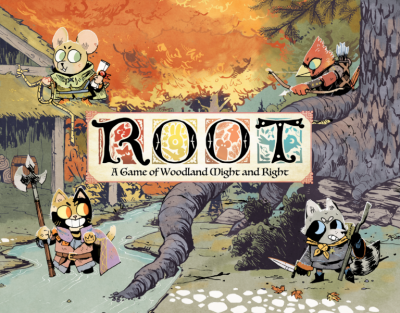 Root is designed by Cole Wehrle (Pax Pamir, An Infamous Traffic, and John Company) and brought to life by master illustrator Kyle Ferrin (The Vast series, Stitches). In the Root RPG, players will take on the role of Vagabonds, adventurers who have come to the woodland seeking riches and adventure. The factions of the forest, however, see the Vagabonds as potential allies against their enemies—or as threats who must be contained or destroyed. Will they join with those who would rule the forest? Or will the Vagabonds pursue fame and fortune on their own terms? Magpie Games has scheduled a mid-2019 Kickstarter for the Root RPG Core Rulebook, with plans to release the game and further supplements into retail in early 2020. For more information about the game, fans can register for updates and announcements at www.rootrpg.com. The Root licensing agreement was brokered by Christi Cardenas of The Plains Agency on behalf of Magpie Games, and by Zachary Strebeck of McArthur Law Firm on behalf of Leder Games.